We arrived in Cordoba by train. 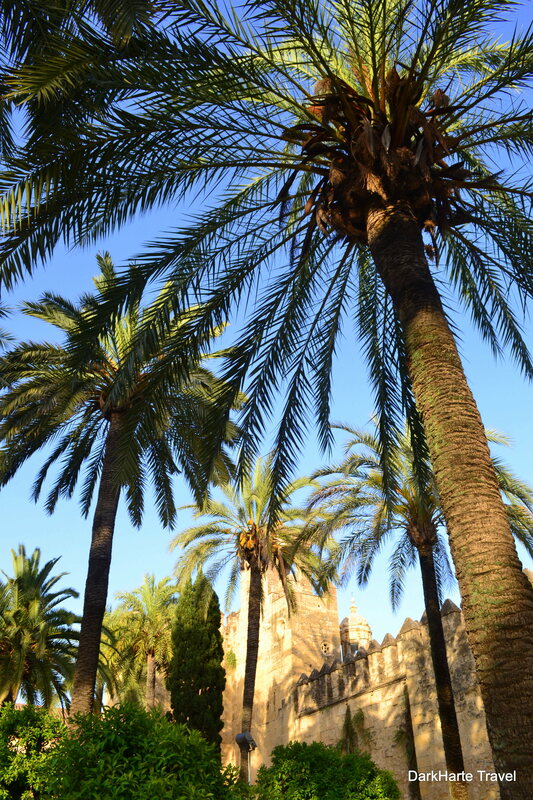 It was 34 degrees when we arrived so not as hot as Seville. 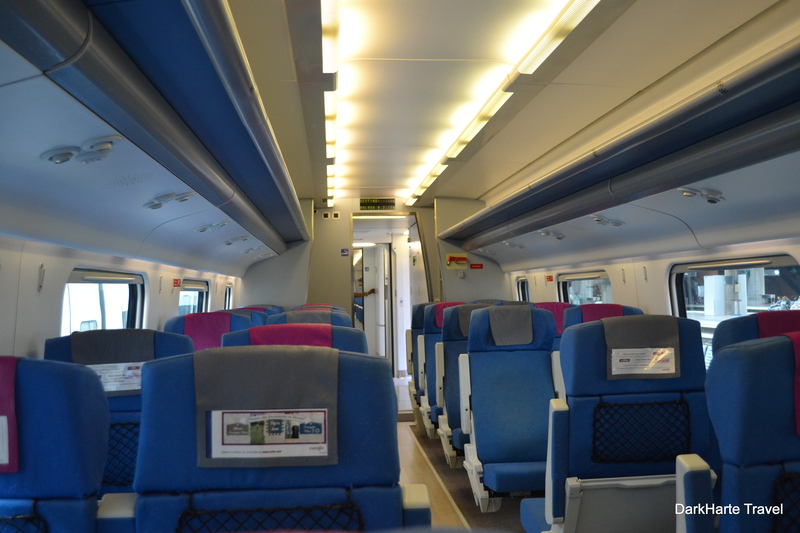 The train had been spacious, clean and air-conditioned, and heading for Malaga. We were impressed as it was much nicer than British trains. We caught a bus from the train station and after a quick journey downhill and past a Roman temple, we had only a short walk to our pensiõn – a totally different experience to Seville, which had involved two and a half hours of struggling to find the train station, the bus stop, then the pensiõn. After unloading our backpacks we set off to explore the city in the hot afternoon. 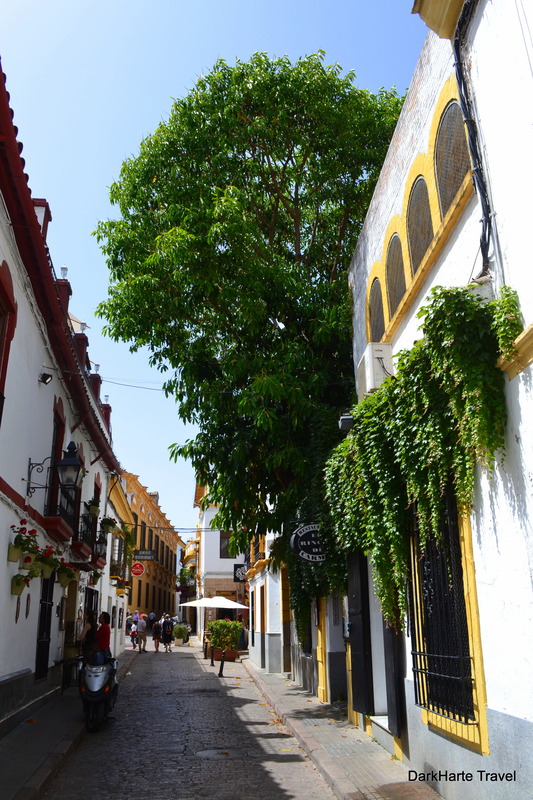 We wandered the little alleyways, which are generally wider than those of Seville’s Old City, into the Juderia (the Jewish quarter), which is an extensive area in Cordoba. We visited the synagogue in the Juderia. I was stunned to learn it is one of only three in Spain, and the other two are both in Toledo. It was rather sad then that the synagogue is very small and dilapidated, and no longer operational. It was a very popular site, and on our walk there we got trapped behind two of the large 70-strong tour groups that crammed into the narrow alleys. 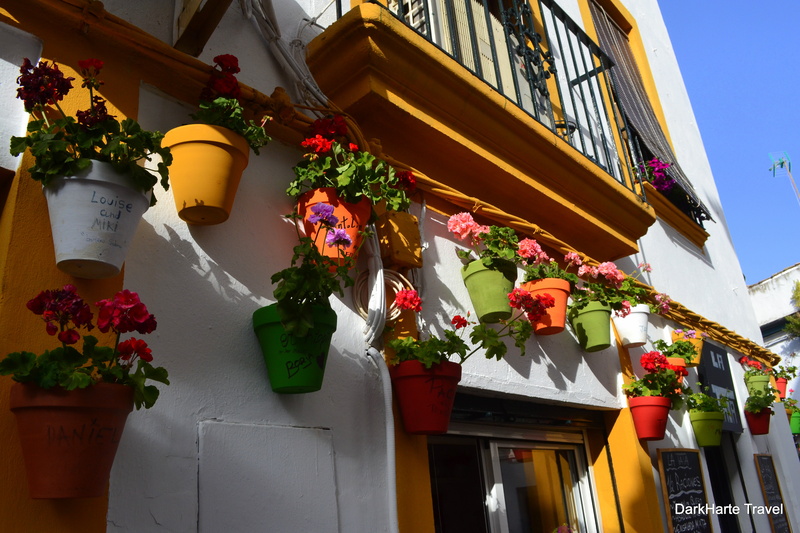 There was also a patio festival on in Cordoba, with lots of flowering balconies around the city and splendid, verdant patios and roof terraces. We walked towards the river down the street named San Fernando, and heard a marching band coming along. We stopped and waited for the band to appear. 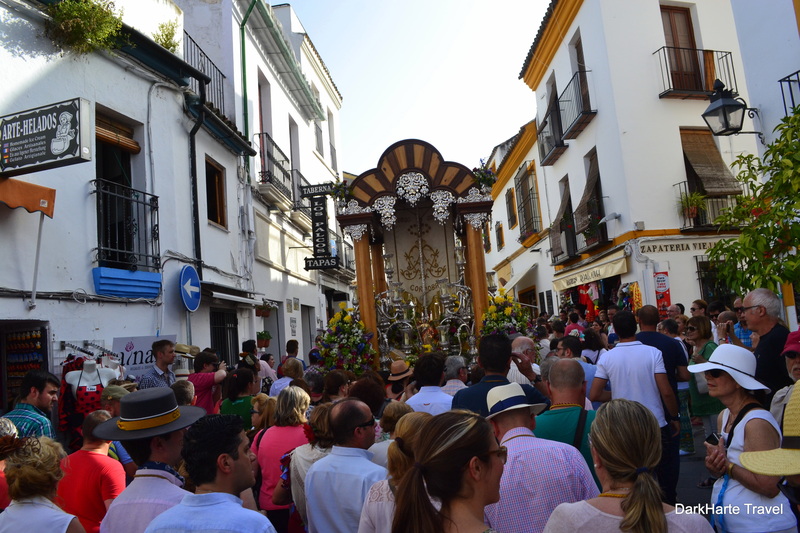 Then we followed the procession all the way to the Mezquita, carried along in the wave of the crowd. 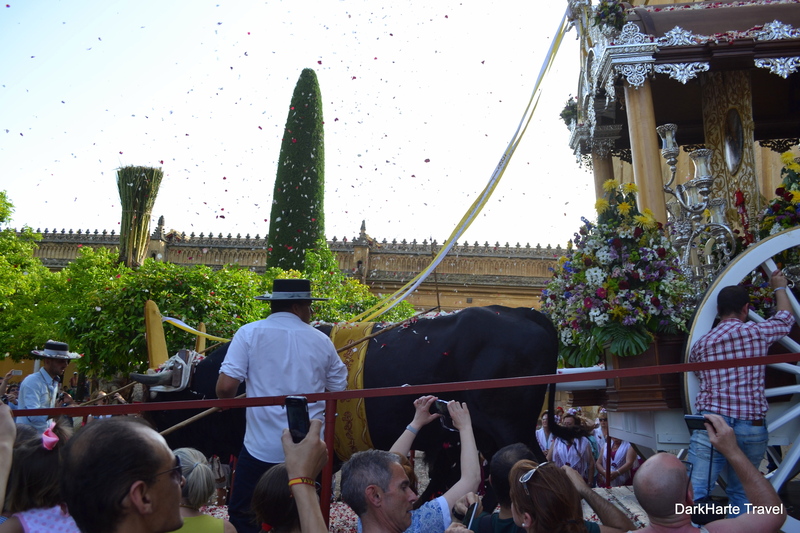 A carriage pulled by two magnificent bulls and transporting an effigy of Mary made its way to the doors of the cathedral. 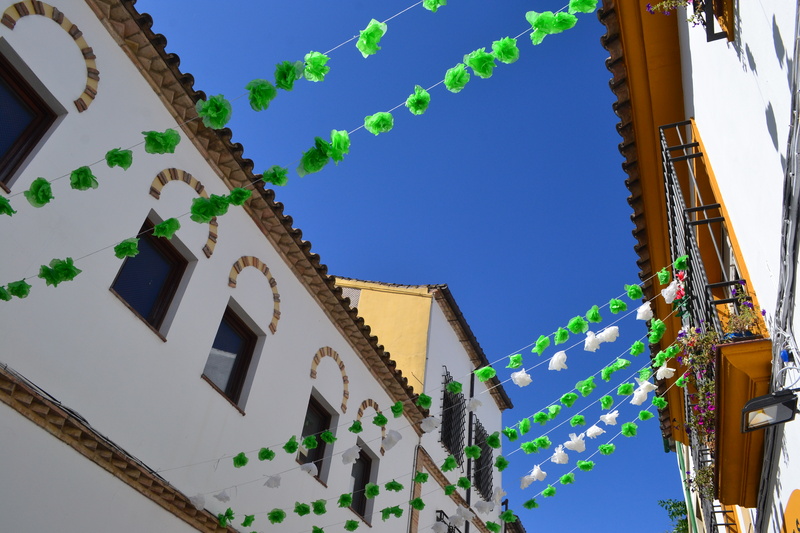 It was the first day of the festival of Cordoba, and the procession was the first in a series of celebrations that take place over five days. 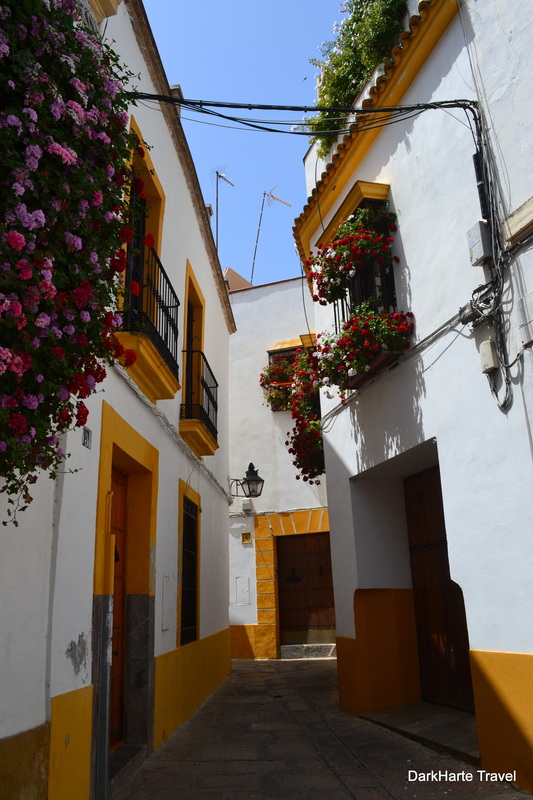 On our second morning in Cordoba we had breakfast at a juice bar on San Fernando street, just a few doors down from the little lane leading up a hill to our pensiõn. 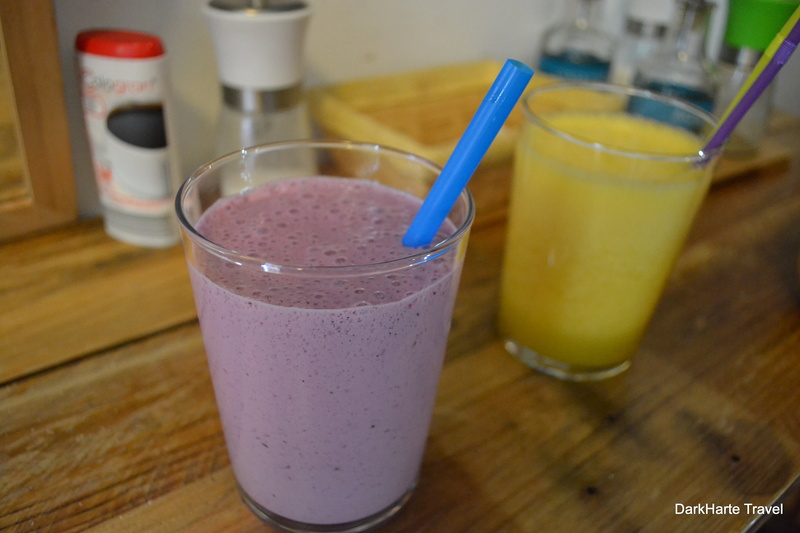 We had a delicious thick ‘berries’ milkshake and orange, apple and pineapple juices with lemon ice cream and fruit. 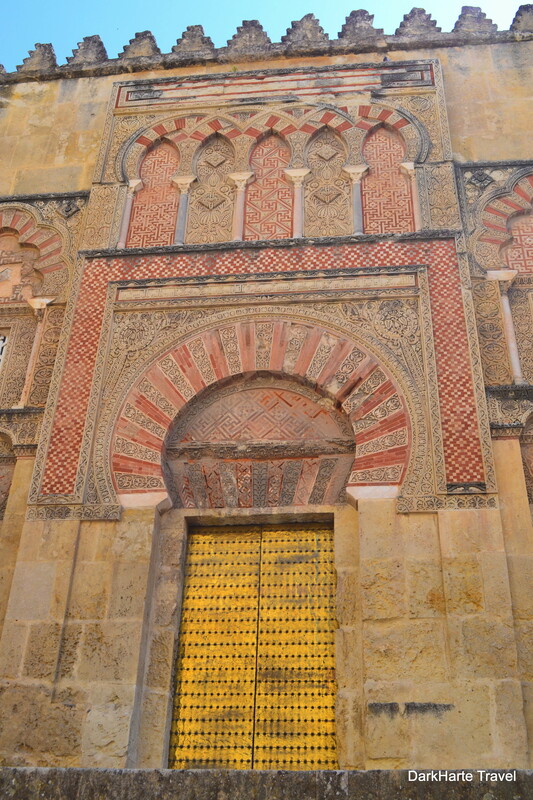 After this refreshing and tasty breakfast we went to the Mezquita, the mosque-cathedral in Cordoba’s old city. 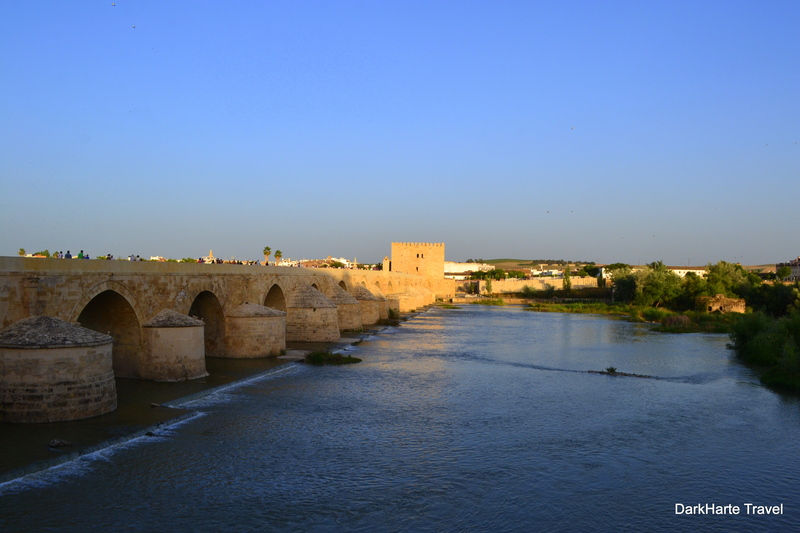 It stands beside the river and is the premier sight in Cordoba. On the way there we walked the route of the bulls and entourage that we had followed the day before. 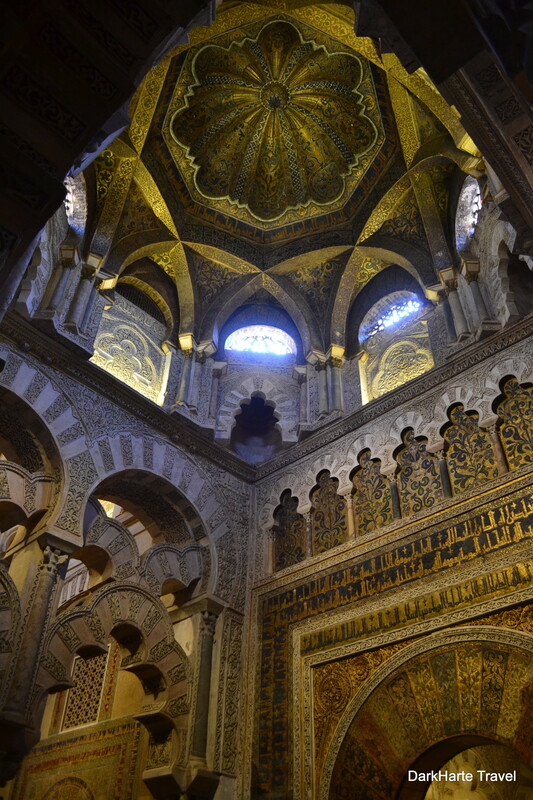 After queueing a while for a ticket only to be turned away, we entered the Mezquita at last – stepping into a darkened, palatial interior with columns and the famous red and white arches. 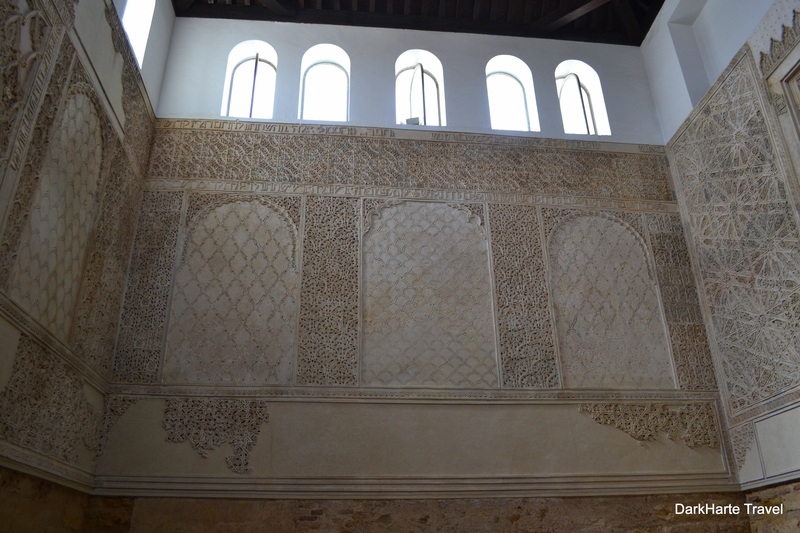 These are the original pillars of the old mosque, which was built by Andalucia’s Arab rulers in the 8th century. 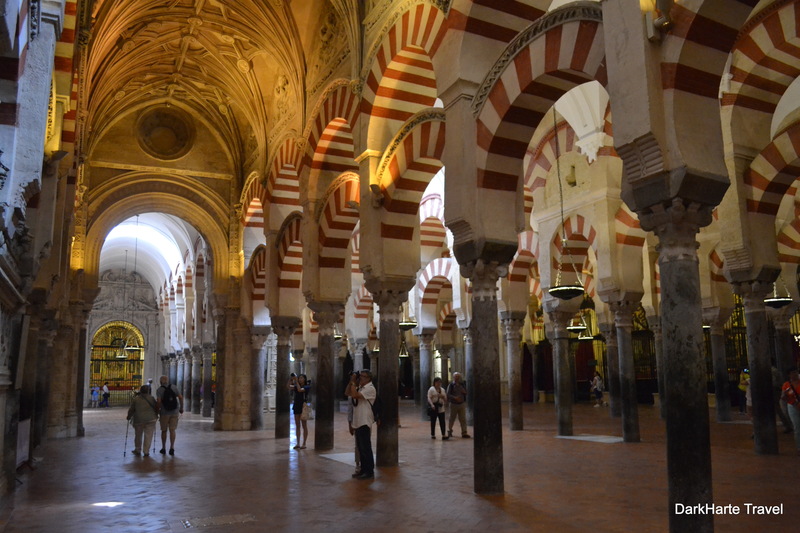 By the 13th century the southern part of Spain was Christian, leading to a Catholic cathedral being built in the central part of the Cordoba mosque. The Mezquita is absolutely beautiful, and one of the most interesting places I’ve ever seen: a fascinating fusion of Catholicism and Islam. The remnants of the mosque are amazing. 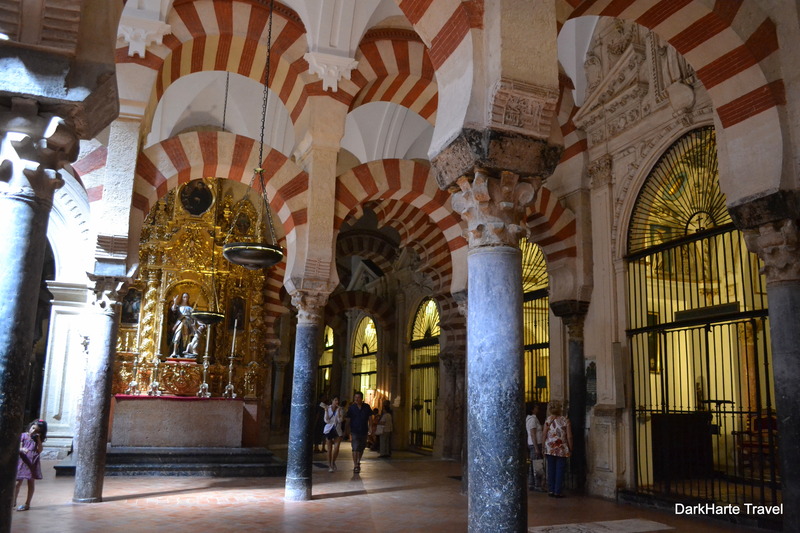 The Catholic parts were like eating a cake that is too sickly; while the Moorish parts are ornate in a beautiful way, the cathedral parts are ornate in a heavy, ostentatious way. I found the Catholic parts of the building overbearing, but the mosque parts uplifting, spiritual, and beautiful. Originally the mosque would have been open to the courtyard outside, and full of light. When the cathedral was built the sides were closed up, and today the interior is quite dark. After exploring the Mezquita we ate lunch at 101 Tapas in a side street off the Mezquita, where we had a 10 euro set menu each. I had pisto (sauteed vegetables – tomato, aubergine and courgette, with an egg fried in it), then carne con tomate con patatas fritas (pork in tomato sauce with chips), then ice cream for dessert. My girlfriend sampled salmoreja, a Cordoban speciality, a cold soup made of tomatoes with garlic and bread puree, finished with a boiled egg and jamon (cured ham) sliced on top, then meatballs followed by fruit. We were very full after our three courses and walked along the promenade beside the river, to the botanic garden (jardin botanico de Cordoba). It was absolutely baking by now and I was hoping for lawns and shady trees in the garden, which never materialised. Instead there were lots of low-growing plants in beds surrounded by paved paths. The garden wasn’t very interesting to me as a non-gardener, as it lacked any nice trees, interesting landscaping, or water features, and was just beds not of Spanish plants but of generic ones from anywhere. We did not have the energy to move far and spent a while simply sitting on a bench in the shade, too hot in the 43 degree still air to do anything much. We left the garden and walked back along the river, and climbed down some stone steps to the riverside. 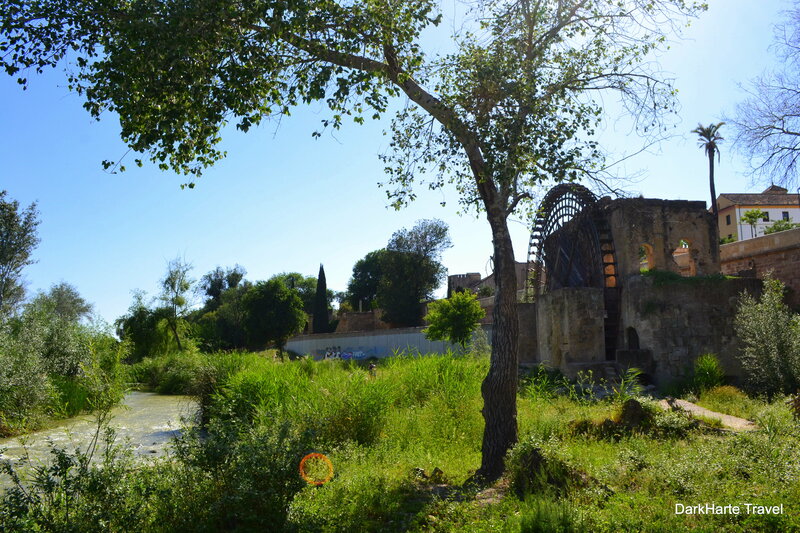 We wandered around the old Arabic waterwheels that are there, built into the side of the old city wall. From down by the waterwheels we could see the Roman bridge from the level of the water. Pigeons were landing on a little island in the broad, shallow river, where they could drink and cool off. It was much cooler beside the river than it had been up above in the city and botanic garden, and it was pleasant to be among the verdant green vegetation growing down there. There was litter lying around, the waterwheels were in ruins, and the vegetation unkempt, but I was happy there, and enjoyed it far more than the 3 euro visit to the botanic garden. It was fun to climb around the old wheel, exploring, and we saw two lizards run from the long grass onto hot stones. 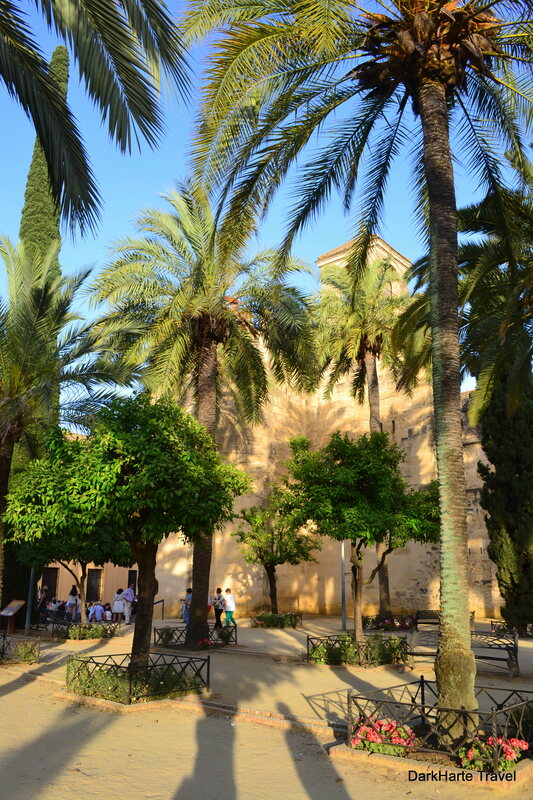 Then we walked into town past Cordoba’s alcazar, and had a a revitalising coke at a street cafe. We went into a couple of souvenir shops to browse, and then stumbled upon a museum at the end of a dark, enclosed passageway leading off the street. It was 7.15pm by now but the museum was still open so we went in. It was a museum about the Spanish Inquisition and the torture methods it used, set in atmospheric low lighting and bare stone rooms. It was a very good, interesting and educational museum, but also sickening and harrowing. It made me realise that Medieval Europe was a terrible dark place and feel very lucky to live in our own era. After the museum we headed east to Plaza de la Corredera, where we ate tapas for dinner (again!). I had fried cod and mozzarella croquettes, and Mel had aubergines with honey and a selection of croquettas: ham, spinach and tuna. I’ve found tapas can vary widely in value, quality and presentation, and these were great – the best we’ve had, and also the cheapest at 1,50 per dish. 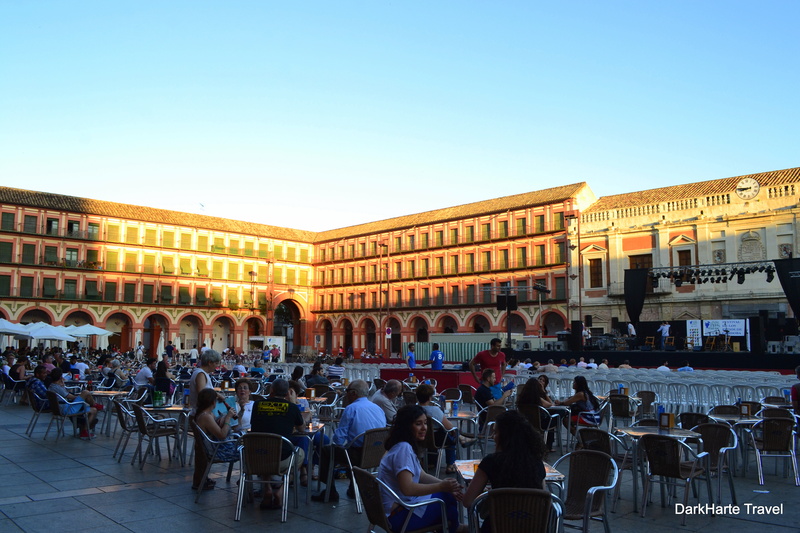 The Plaza de la Corredera is a vast square with colonnaded buildings round the edge. 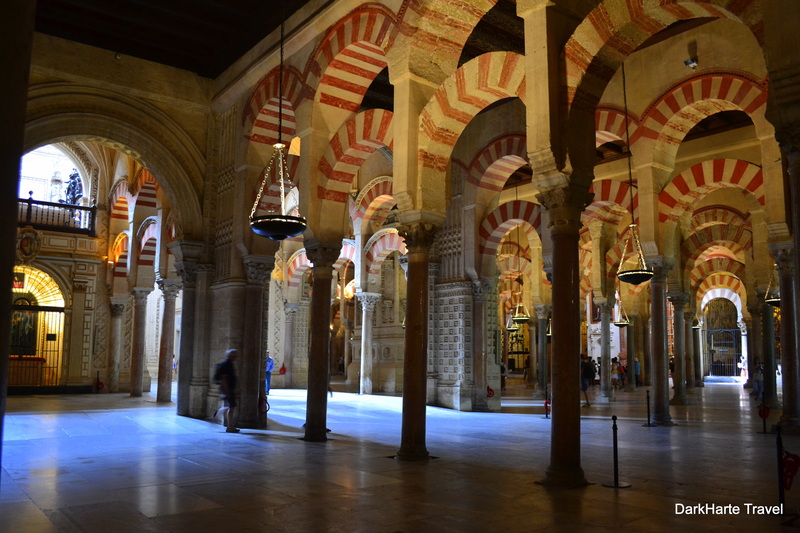 Their red and white arches recall the arches of the Mezquita – indeed much of the architecture around Cordoba reflects the red and white of the beautiful mosque-cathedral. We left just before 10pm, wandered uphill and found the Roman temple, which we had seen from the bus on the way into the city. Stray cats were eating and drinking in the temple, which is a haven for them since dogs and people are kept back by fences. The temple itself looked striking with its white columns against the black night sky, and stars were starting to come out.